This entry was posted on January 25, 2019 by B4S. 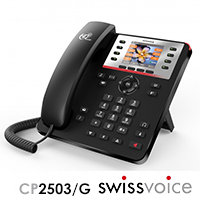 The CP502 model from Swissvoice is their entry level ( cheap ) IP phone but still sports a decent looking colour screen ( 2.8'' in size ) and the facility to manage up to two SIP accounts. Sound quality is also enterprise level with Wideband Audio along with Acoustic Echo cancellation with a Duplex Speakerphone. Once can also connect a headset via an onboard port. The telephone's functions are accessed via a generic keypad, 2 programmable function keys and 4 customisable softkeys. The telephone is available also as a "G" version - being supplied with dual Gigabit Ethernet ports. 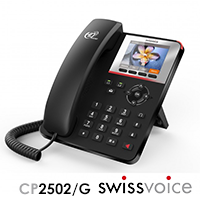 .Next up is the slightly higher featured CP2503, perfect for someone who makes more use of the phone than others. This can take up to four SIP accounts and comes with the same colour screen as its predecessor. Operation of this VoIP Endpoint is improved with 8 programmable keys and a navigator dial. The on board phone book will support up to 500 numbers ( alpha-numeric ) and store a call log of up to 100 entries. The phone also has a useful RJ9 headset socket. 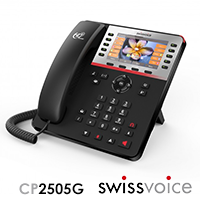 The SWISSVOICE CP2505G is the high end offering from this series. The screen has been enhanced with a vibrant 4.3" colour TFT display which can receive video streaming. The SIP telephone is controlled via 10 programmable keys, 4 customisable softkeys for business processes and an easy to use navigation dial. The phone is capable of 3-way conferencing via its duplex speaker ( Wideband with Acoustic Echo Cancellation ). The CP2505G has a USB port which can be used for either the addition of a Bluetooth™ dongle or for a memory stick for call recording. All this is enhanced with dual Gigabit Ethernet ports. It can control up to 6 SIP accounts. These Swissvoice SIP phones will be compatible with most VoIP/ SIP platforms though will need provisioning and are compliant with MetaSphere CFS version 9.4 platform from Metaswitch. If you would like more information on Swissvoice SIP telephones for your workplace or just would like to discuss your business communications strategy then call us on 0844 824 6664 or contact us via the form here.